If you missed the hit in question, watch it below. Until further notice, this is San Jose’s Stanley Cup. And further notice begins this weekend against Colorado. The Sharks, the very definition of Not Good Enough When You Need Them Most, achieved their greatest moment ever as an organized team Tuesday night by beating the Vegas Golden Knights, 5-4 in overtime, to win this Western Conference first round series in the most improbable way ever devised — and if you try to say the 5-0 win over Nashville in 2016 that sent them to the Cup Final against Pittsburgh was bigger, we will respectfully dismiss you as a philistine and an idiot. Because overtime was the fifth-most important thing about Tuesday. The Sharks finally, after all these years, became made men. The Fin Of Disappointment, so named because they have largely been about playoff failure, cheated all the deaths Tuesday — all of them. Barclay Goodrow’s goal with 1:41 to go completed a comeback that made all other hockey comebacks bend the knee, and yes, that includes The Miracle On Manchester. After watching his players get booted in the opening round for a fifth straight time, and third overseeing the Toronto Maple Leafs, Mike Babcock must have felt the daggers raising from the fists of a city that swore this time things would be different. Four times the head coach passive-aggressively blamed goaltender Frederik Andersen — arguably the club’s most valuable player through 88 games this season, saying some variation of "They threw them at the net, they went in." He directed fans’ attention over here, to Nazem Kadri and how the third-line centre’s reckless suspension (again) might have cost the team this series. "It was unfortunate, the incident with Naz. Obviously, he wasn’t available. It was like an injured player in the playoffs, and we thought that was going to give us some depth and would have allowed us to move Willy [Nylander] around a bit, which we were never allowed to do," Babcock said. "As a management team, we’ll look at our group and see what we can do to get better." The optimism was so much higher, the roster so much deeper walking into TD Garden this time, yet the result was infuriatingly, deflatingly familiar. Another horror-show elimination game in the Maple Leafs’ own zone. Another argument for grizzled experience over flashy youth. Another Game 7 victory for the Boston Bruins. Below, read Bruce Arthur, Steve Simmons and Kristen Shilton. They play for more than the Stanley Cup. They play for each other. That was the essence of what will go down as one of the great games in NHL history. When the San Jose Sharks defeated the Vegas Golden Knights 5-4 in overtime in Game 7 of the Western Conference First Round at SAP Center on Tuesday, they did more than roar back after trailing 3-0 in the third period, more than recover from a late tying goal. They did more than win a best-of-7 series after trailing 3-1 for the first time in their history, more than advance to play the Colorado Avalanche in the second round starting here Friday. They rallied for their injured captain, Joe Pavelski. "The boys, they got together and they said, 'This is for Pav,'" center Joe Thornton said. "So we love him. It was just a matter of will, and we willed that one for him." Below, catch the game highlights, the OT goal, handshakes, Pavelski injury and coach Gallant post-game. 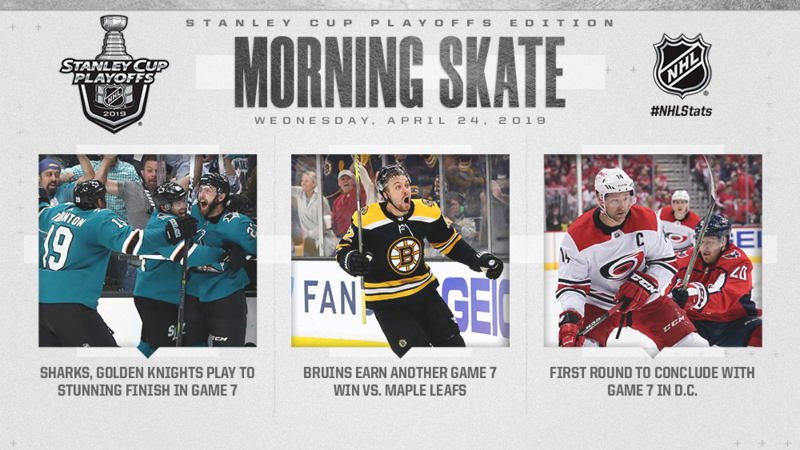 Goodrow caps Sharks’ stunning comeback with overtime winner; Bruins earn another Game 7 win over Maple Leafs; First Round to conclude tonight in D.C.. The Bruins will face the Columbus Blue Jackets in round 2. Toronto had a good 2nd period but other than that, nada. Boston played their game tonight and deserved the win. Oh, and another year for no Cup in Canada. Handshakes can be watched below. added 10:08pm, Game highlights below. added 10:18pm, Babcock presser below. From the entry 'Morning Line- Jonathan Marchessault'. From the entry 'Videos- The San Jose Sharks With An Overtime Win In Game 7'. From the entry 'Open Post- Two Games For All The Marbles Tonight'. From the entry 'The Boston Bruins Defeat The Toronto Maple Leafs 5-1'. From the entry 'Sergei Fedorov Back In The Wings Organization? '.